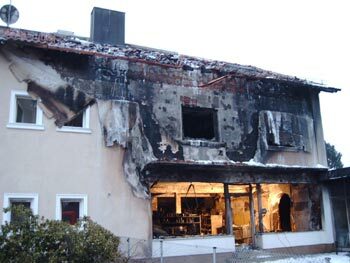 On 03/17/2006 at 03.07 a m the fire departments of Nittenau and Bergham were alarmed for a house fire in the Jägerweg in Nittenau. At the arrival the house was already completely on fire. On the ground floor there was a store with paint, lacquer, curtains and carpets, on the first floor empty apartments. There were no persons inside the building. Several SCBA units started fighting the fire inside and from the VFD Nittenau ladder, also using foam. 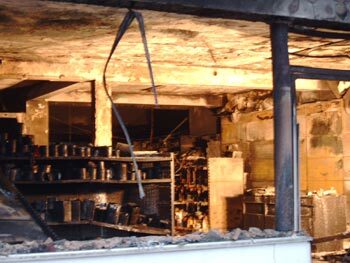 As the roof truss caught fire over and over again, the roof had to be opened almost completely. 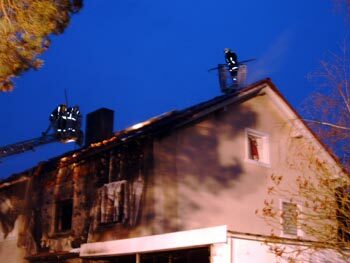 The ladder of the VFD Neunburg was thus called for support and opening the roof at the southern side of the building. Additionally, the VFD Fischbach was alarmed as more SCBA units were needed. The material damage was about 500000 EUR.